EnamelCookwarePlus.com: Time To Grill Some Fruit ! Time To Grill Some Fruit ! Chicken...Ribs...Veggies...Now Fruit On The Grill !! Your favorite fruits - Pick whatever fruits you are in the mood for! The grill is a great way to enhance the flavor of the fruit by itself or add it to another dish! 1. First preheat your grill for 10-15 minutes and then brush the grates clean. 2. Prep whatever fruit you choose (rinse and peel/slice if necessary). 3. Set the grill temperature between 350-450F. 4. Place fruit on the grill or in grill basket. Large slices can go directly on the grill, but small fruits like blueberries or raspberries will need to be placed in your grill basket. 5. 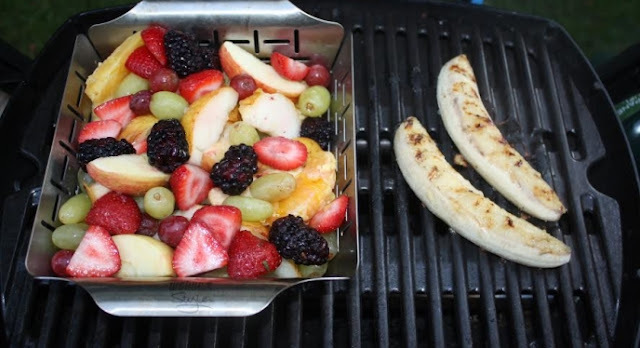 Grill fruit for about 6-8 minutes. The larger fruits may need an extra few minutes in order to really caramelize the fruit. Get out the grill..time to BBQ ribs !